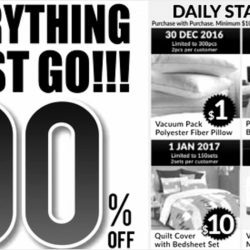 Till 2 Jan 2017 Jean Perry: Ex-Stocks Warehouse Clearance Sale Up to 90% OFF Beddings & Bedlinen! Wanna get new beddings and bedlinen for the New Year? Head to Jean Perry's Warehouse Clearance Sale happening from now till 2 January 2017! Enjoy up to 90% off beddings, quilt cover sets, bedsheet sets and more. Prices start from $1 so head there early!